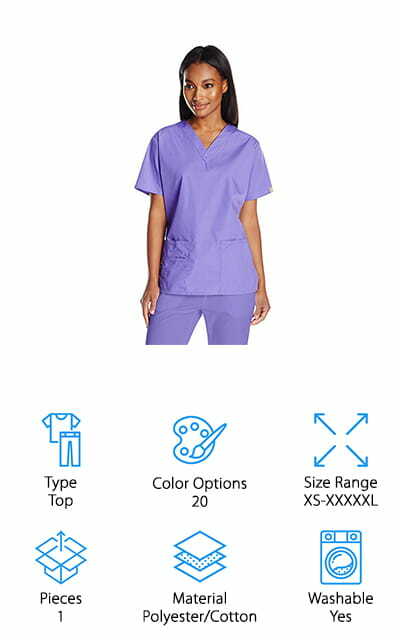 Whether you’re looking for designer scrubs for women or something practical and durable to stand up to long shifts at the hospital, you’re in the right place. It’s not always easy to find scrubs that fit well and are comfortable. We researched some of the best-selling, top-rated scrubs for women to find tops, pants, and sets that are both stylish and practical. Before we get into our reviews, let’s take a look at some of the key features you should consider when shopping. Type: We found a nice mix of tops, pants, and sets so you can find just what you’re looking for. Sometimes it’s easier to mix and match, especially if you need a special size like tall or petite. Color Options: Some workplaces have very specific requirements when it comes to scrub colors while others are more lax. Whether you need white, ceil blue, or hunter green or you prefer something bright or just a pop of color, you’ll find it here. Size Range: Most of our picks come in a wide range of sizes, some as small as XXS and as large as XXXXXL. Pay attention to pant length, too. A lot of the options that include pants come in both petite and tall. Pieces: Tops and pants come with only 1 piece per product while sets have 2. While some multipacks are available, we figured it was best to give you single pieces since part of the fun of wearing scrubs is mixing and matching. Material: All of these scrubs are made of a blend of materials. Most contain polyester blended with rayon, cotton, and/or Spandex. This is so they’re comfortable, durable, and washable which you need if you work in healthcare. Machine Washable: It’s really important that scrubs are washable. If you wear scrubs to work, you probably come in contact with a lot of different fluids and other stuff that’s, well, kind of gross. It’s important that they’re easy to clean. Now that you know a little more about what to look for, let’s move into our reviews. If you’re in a hurry, start with our top and budget picks. They’re right at the top of the list and really give you a good idea of the range that’s available. Stick around if you can, though. All of these products are unique in their own way and worth a closer look. Alright, are you ready? Let’s get to it. Our top pick is the Grey’s Anatomy Scrub Pant which features a straight-leg style design with a thick, yoga-style drawstring waistband for added comfort. Front leg seams add a little bit of extra detail and there are four pockets so you have plenty of room to carry everything you need for your shift. The polyester/rayon ArcDry material is moisture wicking and keeps you cool and comfortable while working for all-day freshness. These pants are available in a wide range of sizes and if you need a special length, don’t worry. They’re available in petite and tall, too. That’s not all, with 35 different colors to choose from, you’ll be able to find just the right shade to match your employer’s dress code or just pick the one you really like. 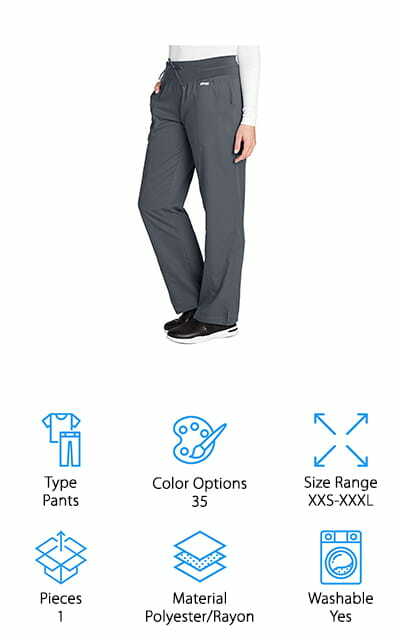 If you’re looking for a pair of cheap scrubs for women that are really comfortable and a great fit, take a look at our budget pick, the Dagacci Scrubs Set. This set includes a classic unisex style V-neck top and straight leg pants. Plus, there are plenty of pockets. The top has a chest pocket with pen slot and two front patch-style pockets and the pants feature 3 cargo-style pockets on the legs as well as standard side pockets. In other words, you have plenty of places to keep everything you need handy. This set is available in sizes ranging from XS to 5XL. The XS has a 29-inch inseam and the 5XL is 32-inches for a great fit. You have 19 different colors to choose from including popular colors like white and ceil blue. The Grey’s Anatomy Active Scrub Top is a great choice if you want a pop of color without wearing any loud prints. There are 24 different color combinations available. Each features color-block detailing with contrasting raglan sleeves and banding around the sleeves and down the sides. The crossover V-neck design, fitted back, and side vents are all really comfortable, too. There are 3 front pockets, one on the right and a double pocket on the left where you can stash your pens, alcohol wipes, or anything else you need to keep handy during your shift. Plus the polyester and rayon fabric wicks away moisture to help you stay fresh during a long shift plus it’s really soft and comfortable. This top is available in sizes XXS to XXXL and is machine washable. Med Couture Activate Scrub Pants feature a wide dual elastic and knit waistband with front tie closure that’s super comfortable. The boot cut and side vents are stylish plus there are multiple pockets that you’re going to love. In all, there are front pockets, a rear pocket, and cargo pockets on each side. On the right side, the pocket has separate compartments for pens and a smartphone and a plastic D-ring for your ID. The polyester/Spandex blend has 4-way stretch and they’re cut like yoga pants for the utmost comfort. They’re easy to wash, easy to wear, and ideal for a busy lifestyle. That’s not all. Not only are these pants available in a wide range of sizes, but they also come in petite and tall lengths, too. Another great option is the Bravo top from WonderWink. 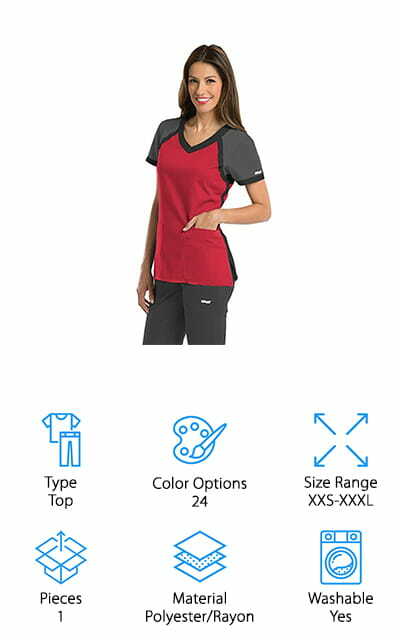 The classic short-sleeved, V-neck design features multiple pockets including the WonderWink signature triple pocket for plenty of places to tuck away the important things you need during every shift. There’s also a bungee loop for your ID and a 3-part accessory loop. It’s available in 20 different colors including traditional hospital dress code colors like white, hunter green, and ceil blue as well as bright, fun colors like orange sherbert, Malibu blue, and sea breeze. The polyester/cotton blend is soft and comfortable but durable enough to last through the longest, toughest shifts. That’s not all, this scrub top is machine washable and available in a wide range of sizes from XS to XXXXXL so it’s a good fit for any body type. 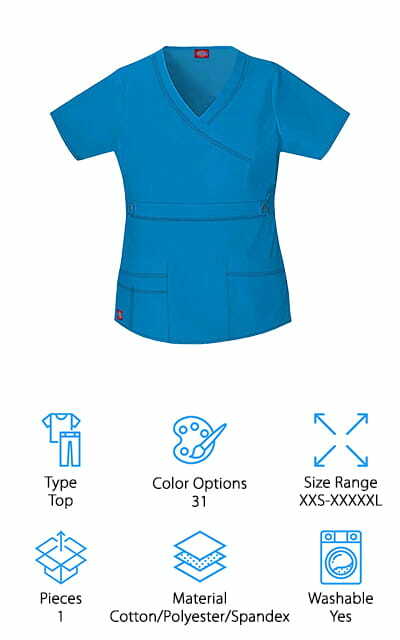 One of the best Dickies scrubs for women we found in our research is this mock wrap scrub shirt. The blend of polyester, cotton, and Spandex is soft and comfortable with just the right amount of stretch. It’s not always easy to find a stylish scrub top but this one does a pretty good job. Why do we say that? It features eye-catching details like a crossover neckline and contrast stitching as well as princess seaming that provides a more feminine shape. There are 2 large front pockets, one with multisectional stitching so you can keep smaller items in place. 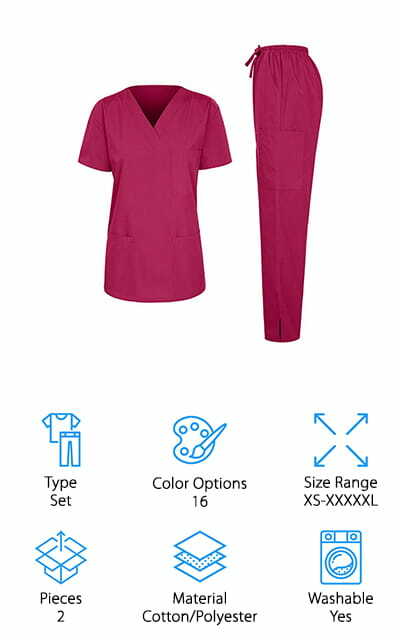 This scrub top comes in sizes XXS through XXXXXL and is available in a variety of different colors. There are 35 to pick from so you can easily adhere to the work dress code. Dickies really does have a way of making scrubs look stylish which is why we have to include their Gen Flex Scrub Pant in our top picks. The low rise, straight leg fit is modern and has a lot more shape than a lot of the other pants out there. An adjustable drawstring and all-around elastic waistband are really comfortable and the cotton/polyester/Spandex blend are really soft and provide just the right amount of stretch. There are a lot of pockets, too, including 2 in the front, 1 in the back, and a large cargo pocket on the right leg. To top it off, they use contrast multi-needle top stitching for an extra pop of color. These pants come in a wide range of sizes as well as petite and tall. 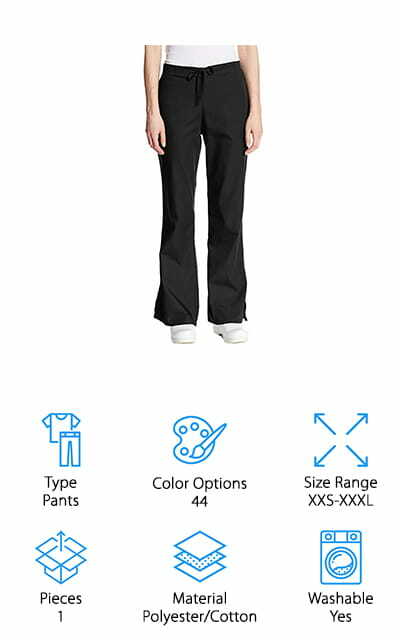 Whether you’re looking for white, bright, or black scrubs for women, you have to take a look at the Cherokee Drawstring Scrub Pants. For one thing, they’re available in 44 different colors. You’ll find everything from ceil blue to dandelion to taupe so you’ll definitely be able to match any dress code. The flared leg adds a bit of style and there’s plenty of pocket space, too, with 2 front pockets and a large back pocket. As for the waistband, there’s a drawstring closure and elastic gathering around the back so you can get the perfect fit. 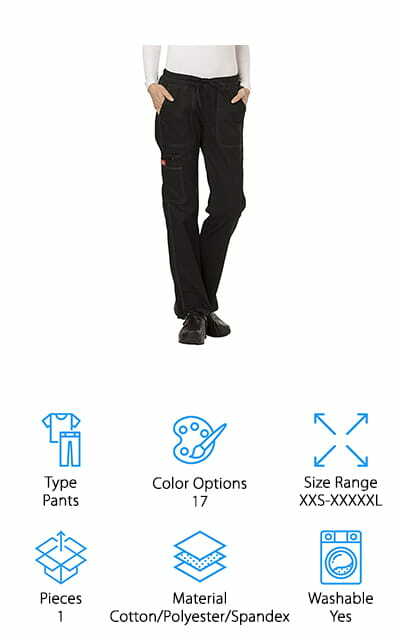 The polyester/cotton blend is durable and machine washable which makes these pants a good choice for a fast-paced, messy work environment. There are a lot of sizes available, too, including petite and tall. 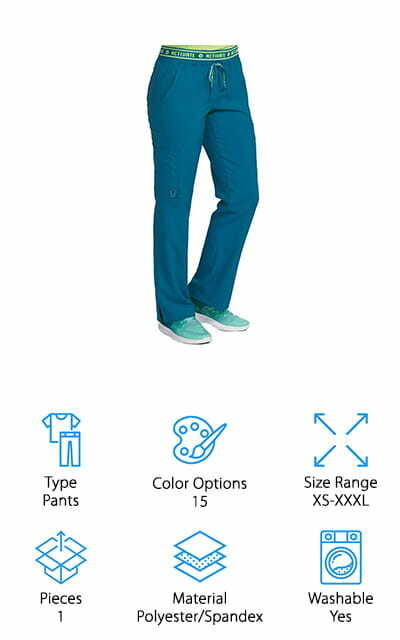 Another good option if you’re looking for khaki scrubs for women is this set from iliad USA. The cotton polyester blend material is durable and machine washable to tolerate anything they’ll come in contact with during a busy shift in the hospital or at the lab. The colors of these scrubs are deep and saturated and one of the best things about them. In addition to khaki, they also come in muted colors like black, grey, and brown as well as eye-catching bright colors like orange, red, and sky blue. The top features a classic V-neck style with a chest pocket and 2 lower pockets while the pants have 2 side pockets and a cargo pocket on left leg. One more thing, the pants have both an elastic waistband and a drawstring for the perfect fit. Last up in our reviews is the MedPro medical Scrub Set and if you've been waiting for something with bright, fun prints, you’re in luck. 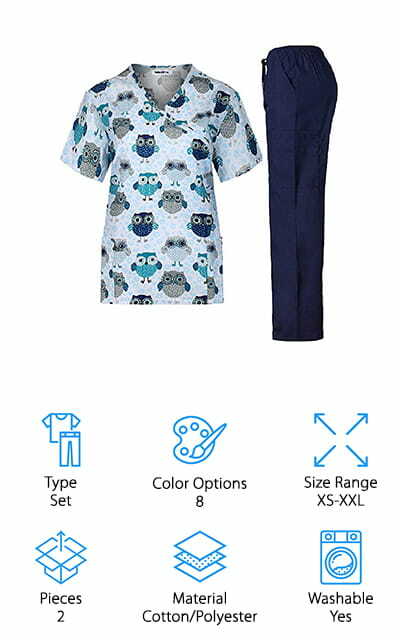 This set includes a classic V-neck mock-wrap style scrub top in one of 8 different prints along with a pair of coordinating pants. Choose from paisley, floral, cartoon, or animal prints for the top. Each of the patterns is multi-colored and will probably match some of the scrub pants you already have which makes this a really versatile addition to your work wardrobe. The pants included in the set feature a full elastic and drawstring waistband, 2 slash side pockets, and a cargo pocket while the top has 2 lower patch pockets. Plus, the fabric is thick and durable enough to stand up to many trips through the washing machine.